Bryant Park Blog: Bryant Park By the Numbers: Ping Pong Balls, Blades of Grass, and More! Bryant Park By the Numbers: Ping Pong Balls, Blades of Grass, and More! We keep thousands of data points about the park, from the number of chairs we have to the number of guests we have during the day. Every week, we share a new data point in our e-newsletter, MidCity News, in a section called "Bottom Line." Here is a selection of some of our recent Bottom Lines. 64. To keep Bryant Park in tip-top shape and running smoothly on a daily basis, Bryant Park Corporation maintains a staff of 64 employees, including Sanitation, Security, Horticulture, Le Carrousel, Visitor Service, and Daily Activities. 2,600. 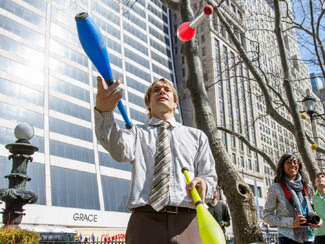 Just over 2,600 people have learned to juggle since August 2013, and have an “I Learned to Juggle at Bryant Park” button to prove it. Jugglers call Bryant Park home. 3,000. Every year, we scoop out the coins visitors have tossed into the Lowell Fountain, clean, count, and deposit them in the bank. We harvest about $3,000 worth of coins annually. Read more about the process in the American Numismatic Society’s newsletter. 193,000,000. Park Manager Brian Schliessman estimates that there are over 193,000,000 individual blades of grass in Bryant Park’s lawn. That’s an average of 3,000 blades for each of the lawn’s 64,500 square feet. That's a lot of grass! 2,500. Players at the Tables go through upwards of 2,500 ping pong balls from April to November, a testament to the area’s growing popularity. 1,126. 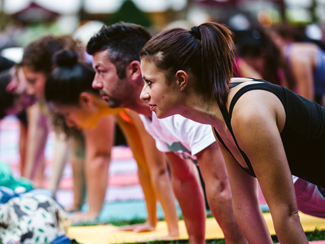 On Thursday, July 16, Bryant Park Yoga set another attendance record with 1,126 participants. Bryant Park Yoga, presented by Athleta and taught by instructors from Yoga Journal, met twice per week. More yogis than ever practice in Bryant Park. 35. This year marks the 35th anniversary of Bryant Park Corporation. In those 35 years, an innovative brand of public/private management has transformed the park from a dilapidated, crime-ridden civic eyesore into a beautiful, immaculately maintained public space that stands as an enduring symbol of New York City’s astounding recovery.